Water soluble cinnamon extract has been shown to increase insulin sensitivity and modulate macrophage activation, a desirable trait for the management of obesity or atherosclerosis. Our present study investigated whether cinnamon water extract (CWE) may influence the differentiation of monocytes into macrophages and the activity of macrophage scavenger receptors, commonly observed in atherosclerotic lesions. 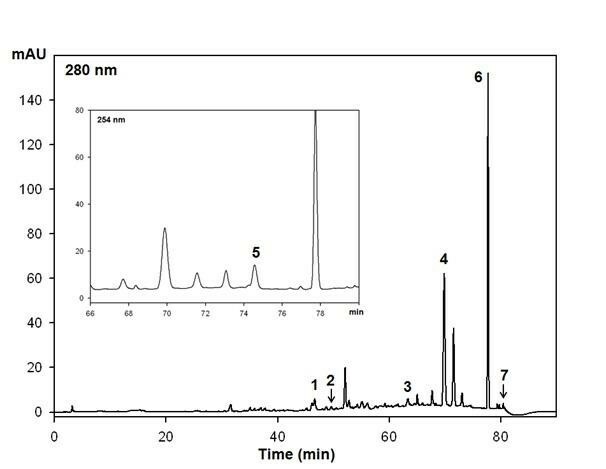 We investigated the effect of CWE on the expression of various surface markers and the uptake of acetylated low density lipoprotein (LDL) in phorbol-12-myristate-13-acetate (PMA)-stimulated THP-1 cells. The protein levels of PMA or macrophage-colony stimulating factor (M-CSF)-stimulated type 1 macrophage scavenger receptor (SRA) were analyzed. Finally, the role of extracellar signal-related kinase (ERK) 1/2 in SRA synthesis and the effect of CWE on PMA-stimulated ERK1/2 were determined. CWE inhibited the differentiation of monocyte by decreasing the expression of CD11b, CD36 and SRA and the uptake of acetyl LDL. CWE suppressed the upregulation of SRA by M-CSF and modulated ERK1/2 activity, which was required for PMA-induced SRA synthesis. Our results demonstrate that CWE was able to interfere with monocyte differentiation and macrophage scavenger activity, indicating its potential in preventing the development of atherosclerotic lesions. Cinnamon is a popular spice around the world and is one of the oldest medicinal herbs. There is increasing evidence showing that cinnamon has anti-inflammatory, anti-viral, immunomodulating, anti-diabetic, and anti-angiogenic effects [1–8]. Circulating monocytes migrate to tissue and differentiate into macrophages . Upon inflammatory stimuli, the number of recruited monocytes is increasing and they upregulate adhesion molecules and scavenger receptors required to be mature macrophages [10, 11]. Although the maintenance of fully working macrophages in tissue is necessary, prolonged recruitment of monocytes into the subendothelial space where lipid metabolites can easily accumulate should be tightly controlled. Macrophages express scavenger receptors that play an important role in host defense and tissue homeostasis . Macrophages not only eradicate microbes, but also clear dying cells, remove cellular debris, and eliminate metabolite buildup in the extracellular matrix. Scavenger receptors bind and internalize exogenous and endogenous damage-associated molecules such as microbial lipopolysaccharide and lipoteichoic acid, anionic phospholipids, beta amyloid peptide, modified low density lipoprotein (LDL), and advanced glycation end products . In the atherosclerotic lesion where reactive oxygen species (ROS) and macrophage-colony stimulating factor (M-CSF) are abundant, macrophages are stimulated to upregulate scavenger receptors and take up modified LDL [13, 14]. Clearance of lipids through scavenger receptors is protective in early atherosclerotic lesions, but prolonged exposure to lipids causes cell death, leading to plaque instability and thrombus formation. Among the many pharmacological effects of cinnamon described above, its insulin-enhancing activity existed only in the water soluble fraction of cinnamon . Previously, we demonstrated that the water soluble cinnamon was able to suppress macrophage-derived proinflammatory cytokines in vivo . In the present study, we investigate whether cinnamon water extract (CWE) may influence the differentiation of monocytes into macrophages and the activity and expression of macrophage scavenger receptors. Cinnamon bark (Cinnamonum cassia Presl) of Chinese origin was purchased from Omni Herb (Daegu, South Korea), and its identification was authenticated by Prof. Choi HY, Department of Herbology, KyungHee University. A voucher specimen (CC-2012) was deposited at the Laboratory of Herbology, KyungHee Unviersity. One hundred grams of cinnamon was pulverized and soaked in one liter of water for 48 h at room temperature and further dissolved by sonication for 1 h. After filtration, the resultant filtrate was evaporated and lyophilized. Samples were analyzed by a reversed-phase HPLC system (Shimadzu, Kyoto, Japan) which consisted of an autosampler (SIL-20A), a binary pump (LC-20 AD), and a photodiode array detector (SPD-20A), and was equipped with a Zorbax Eclipse XDB-C18 column (5 μm × 4.6 mm × 250 mm) (Agilent Technologies, CA, USA). Gradient flows for the two-solvent system (solvent A, 0.1% formic acid in water; solvent B, 0.1% formic acid in acetonitrile) were as follows: 95% A/5% B at 0 min, 85% A/15% B at 10 min, 70% A/30% B at 40 min, 50% A/50% B at 70 min, 40% A/60% B at 75 min, 30% A/70% B at 80 min, 95% A/5% at 85 min, and 95% A/5% at 90 min. The flow rate of the mobile phase was 0.6 ml/min with an injection volume of 20 μl. Detection was at 254 nm for catechin, epicatechin, coniferyl aldehyde, coumarin, cinnamic acid, and cinnam aldehyde (Sigma, MO, USA), or at 280 nm for cinnamyl alcohol (Sigma). Compounds from CWE were tentatively identified with a spiked input of authentic standards, in addition to the comparison of their retention time and UV-visible spectral patterns. Male Balb/c mice aged 8–10 weeks were purchased from the Korean branch of Taconic, SamTaco (Osan, Korea), and maintained with rodent chow and water ad libitum in a temperature and humidity controlled pathogen-free facility at KyungHee University. Mice were cared for according to the guidelines issued by the Guide for the Care and Use of Laboratory Animals issued by the United States National Research Council (1996), and the protocol was approved by the KyungHee University institutional committee for the care and use of laboratory animals (KHUSASP(GC)-10-001). THP-1 cells were obtained from the Korean Cell Line Bank (Seoul, South Korea). Cells were maintained in RPMI 1640 medium (Hyclone, Utah, USA) supplemented with 25 mM HEPES, 1% penicillin-streptomycin, and 10% fetal bovine serum (FBS) (Hyclone) at 37°C under 5% CO2. Peritoneal macrophages were isolated from mice three days after intraperitoneal injection of 2 ml of 4% thioglycollate (BD, Sparks, MD, USA). Cells were cultured overnight in DMEM supplemented with 1% penicillin-streptomycin and 10% FBS. After incubation overnight, nonadherent cells were removed. The MTT method was used to examine the number of phorbol-12-myristate-13-acetate (PMA)-stimulated cells. THP-1 cells (4 × 104 cells / 0.1 ml) were plated in 96-well plates and treated with 10, 50, and 100 μg/ml CWE in the presence of 100 nM PMA for 24, 48 and 72 h. After 2 h of incubation with 10 μl MTT solution (5 mg/ml) (AMRESCO, Solon, Ohio, USA), the medium was aspirated, and 100 μl dimethyl sulfoxide was added. The optical density was read at 560 nm using a microplate reader (Molecular Devices, Sunnyvale, CA, USA). THP-1 cells (2 × 106 cells) were cultured with PMA (100 nM) in the presence of CWE for 48 h. Total RNA was extracted using an RNeasy mini kit (Qiagen, Germany) according to the manufacturer’s instructions, and revere transcribed using Superscript III reverse transcriptase (Invitrogen, CA, USA). The cDNA obtained was mixed with Power SYBR Green PCR Master mix (Applied Biosystems, CA, USA) and 2 pmol primers in a final volume of 20 μl. The following forward and reverse primer sequences were used: SRA, forward: 5′- GCA GTG GGA TCA CTT TCA CAA- 3′ and reverse: 5′AGC TGT CAT TGA GCG AGC ATC-3′; CD36, forward: 5′- GCC AAG GAA AAT GTA ACC CAG G −3′ and reverse: 5′- GCC TCT GTT CCA ACT GAT AGT GA-3′; and actin, forward: 5′-GCAAATGCTTCTAGGCGGACTAT-3′ and reverse: 5′- TGTTTTCTGCGCAAGTTAGGTTT- 3′. PCR was performed in triplicate using a StepOne Real-time PCR system (Applied Biosystems). After an initial heat denaturation at 95°C for 10 min, the PCR conditions were set for 40 cycles at 95°C for 15 s and 60°C for 1 min. Relative gene expression was determined using the standard curve method and normalized to actin. THP-1 cells (1 × 107 cells) were pretreated with CWE or U0126 (20 μM) for 1 h prior to exposure to PMA for 30 min for ERK1/2 activity or for 72 h for SRA synthesis. Mouse macrophages (5 × 106 cells) were cultured with M-CSF (25 ng/ml) (R&D Systems, MN, USA) in the presence of CWE for 24 h. Cells were rinsed in cold PBS and then lysed on ice in RIPA buffer (50 mM Tris–HCl, pH 7.5; 150 mM NaCl; 1 mM EDTA; 20 mM NaF; 0.5% NP-40; and 1% Triton X-100) containing phosphatase inhibitor cocktail (Sigma) and protease inhibitor cocktail (Roche Diagnostics, Germany). After centrifugation at 13,000 × g for 10 min, supernatants were collect, and protein concentrations were determined using the Bradford protein assay reagent (Bio-Rad, USA). The samples were separated on an 8% or 10% SDS-polyacrylamide gel and were transferred to polyvinylidene fluoride membranes. The membranes were blocked with 5% skim milk in Tris-buffered saline with 0.1% Tween 20 (TBST) for 1 h. The membranes were incubated with antibodies against human SRA, actin, GAPDH (Santa Cruz Biotechnology, CA, USA), mouse SRA (R&D Systems), extracellular signal-related kinase (ERK) 1/2, or phospho-ERK1/2 ( Cell Signaling Technology, MA, USA ) diluted in 5% skim milk in TBST overnight at 4°C. The blots were washed with TBST and incubated for 1 h with anti-goat, mouse or rabbit horseradish peroxidase-conjugated antibodies. Immunoreactive bands were visualized by enhanced chemiluminescence using BioFx (SurModics, MN, USA). Cells were incubated with Alexa488-acetyl LDL (2.5 μg/ml) (Molecular Probes, USA) for 16 h in PMA-stimulated THP-1 cells or for 2 h in mouse peritoneal macrophages. Fucoidan (75 μg/ml) (Sigma) or U0126 (20 μM) (Sigma) was incubated 24 h before the addition of Alexa488-acetyl LDL. Cells were washed and harvested with PBS and then analyzed on a FACSAria (BD Biosciences) with the use of FACSDiva software. For every sample, the mean fluorescence intensity of cells was determined. Statistical analysis was performed using student t test or one-way analysis of variances followed by Dunnet’s test for multiple comparison. Calculations were carried out using the SPSS version 20. P values less than 0.05 were considered significant. We identified the known bioactive compounds of cinnamon, cinnamyl alcohol, cinnamic acid, cinnamaldehyde, coniferyl aldehyde, and coumarin (Figure 1). In addition, we confirmed the presence of the water soluble polyphenols, catechin and epicatechin in CWE. The HPLC chromatogram of cinnamon water extract (CWE). Peak identification: 1, catechin; 2, epicatechin; 3, coniferyl aldehyde; 4, coumarin; 5, cinnamyl alcohol; 6, cinnamic acid; 7, cinnamaldehyde. The human monocytic cell line THP-1 is a suspension cell type resembling circulating primary monocytes. Treatment with PMA causes these cells to stop mitosis, adhere to the culture plate, and differentiate into mature macrophages . Before assessing the bioactivity of CWE, we examined whether CWE caused cytotoxicity in PMA-stimulated cells. CWE was not toxic to cells for 24 and 48 h, but the maximum concentration assayed here (400 μg/ml) caused a 10% decrease in cell viability at the end of 72 h culture period (Figure 2A). Then, we measured whether CWE affects gene expression of the scavenger receptors, type 1 macrophage scavenger receptor (SRA) and CD36, and the macrophage-specific integrin, CD11b using real-time PCR. These differentiation markers are upregulated in response to PMA [16–18]. CWE treatment reduced the expression levels of CD11b and CD36 in a concentration-dependent manner (Figures 2B,C). The reduction of SRA gene occurred only at 100 μg/ml, but the magnitude was marked compared with the other differentiation markers (Figure 2D). Effect of CWE on the expression of differentiation markers. A: THP-1 cells were incubated with different concentrations of CWE in the presence of PMA (100 nM) for 24, 48 and 72 h. Cell viability was measured by MTT assay. B-D: THP-1 cells were incubated with CWE in the presence of PMA for 48 h. Total RNA was extracted and mRNA expression was analyzed using real-time PCR. Each gene was normalized with actin. Data are presented as mean ± SD of three independent experiments. * p <0.05, indicating significant difference from cells treated with PMA only. SRA is the main scavenger receptors for the uptake of modified LDL . Fucoidan, polysaccharide sulfate ester isolated from brown seaweed, competes with SRA for acetyl LDL . Mouse peritoneal macrophages were cultured in the presence of fucoidan for 24 h and then incubated with Alexa488-acetyl LDL for 2 h. In the case of peritoneal macrophages, incubation of longer than 2 h did not increase the uptake of Alexa488-acetyl LDL (data not shown). In our experimental setting, fucoidan inhibited the uptake of Alexa488-acetyl LDL by 80% (Figures 3A-D). 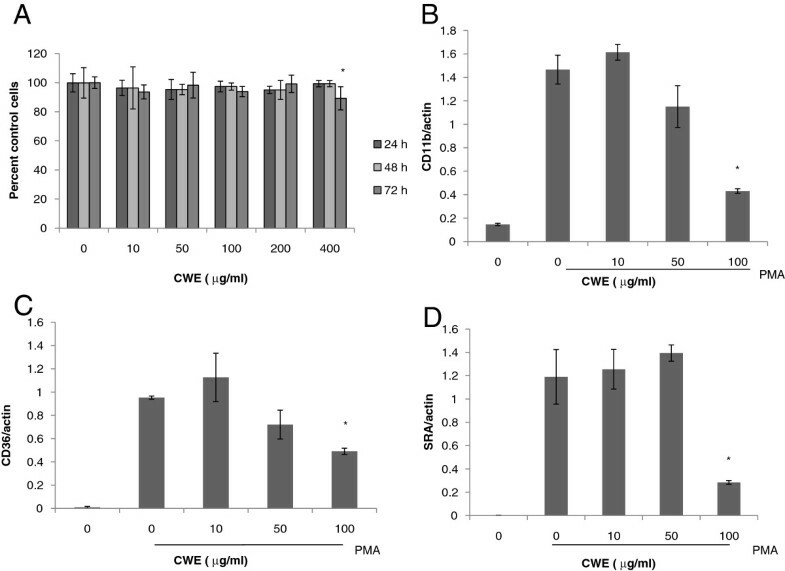 Effect of CWE on scavenger receptor activity. A-D: Mouse peritoneal macrophages were cultured with or without fucoidan (75 μg/ml) for 24 h and then incubated with Alexa488-acetyl LDL for 2 h. Cellular uptake of Alexa488-acetyl LDL was analyzed by flow cytometry. A, cells without Alexa488-acetyl LDL; B, cells with Alexa488-acetyl LDL; C, cells with Alexa488-acetyl LDL in the presence of fucoidan. E-G: THP-1 cells were stimulated with PMA (100 nM) for 24 h in the presence of CWE and then incubated with Alexa488-acetyl LDL for 16 h. E, cells treated with PMA only. F, cells treated with PMA plus CWE (100 μg/ml). H-J: Mouse peritoneal macrophages were cultured with CWE for 24 h and then incubated with Alexa488-acetyl LDL for 2 h. D, G, J: Results are presented as mean fluorescence intensity (MFI) ± SD of three independent assays. * p <0.05, ** p < 0.01 indicating significant difference from cells without treatment. Since an elevated uptake of modified LDL is characteristic of monocyte differentiation , we measured whether CWE may influence the activity of scavenger receptors in differentiating THP-1 cells. 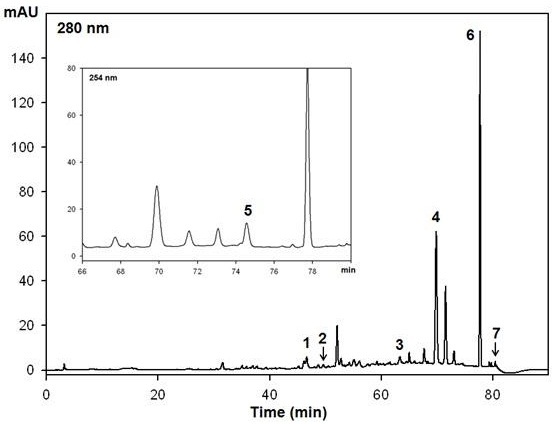 Cells were stimulated for 24 h with PMA in the presence of CWE and then incubated with Alexa488-acetyl LDL for 16 h. CWE suppressed Alexa488-acetyl LDL uptake in a concentration-dependent manner by 47%, 67% and 75% at 10, 50 and 100 μg/ml CWE, respectively (Figures 3E-G). 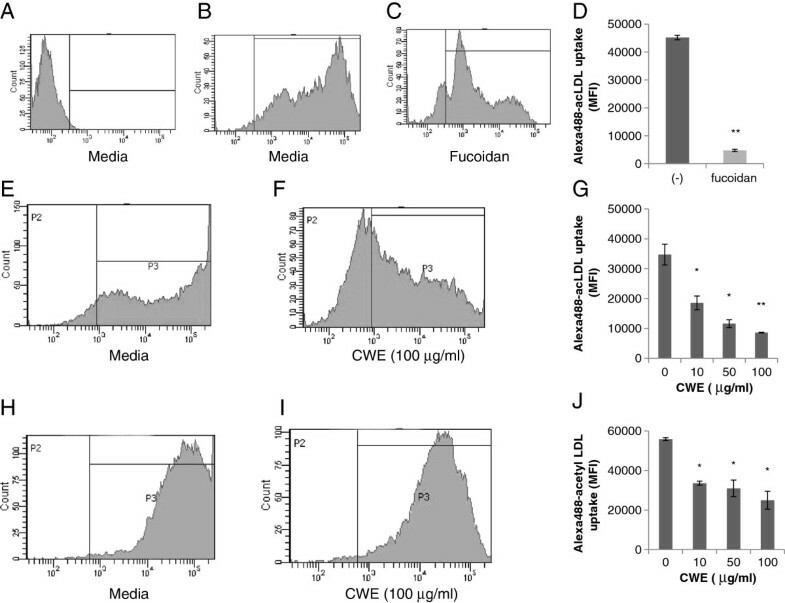 CWE also exerted a similar inhibition in primary macrophage culture: Alexa488-acLDL uptake was reduced by 40%, 45% and 55% at 10, 50 and 100 μg/ml CWE, respectively (Figures 3H-J). In order to make mouse peritoneal macrophages upregulate SRA expression, we stimulated the cells with M-CSF, a cytokine that promotes the differentiation of monocytes and enhances SRA expression in macrophages [20–22]. M-CSF treatment enhanced SRA levels compared with non-treated cells, and CWE at 100 μg/ml almost abolished SRA protein synthesis (Figure 4A). CWE alone appeared not to affect the constitutive synthesis of SRA protein (Figure 4B). Effect of CWE on SRA synthesis. Peritoneal macrophages were cultured in the presence of CWE with (A) or without (B) M-CSF for 24 h, and whole protein was extracted. SRA protein was analyzed by Western blotting. GAPDH was used as endogenous control. One representative Western blot of three or four experiments is shown. PMA stimulates THP-1 cells to enter cell arrest via a Raf-MEK-ERK1/2 signaling pathway, after which they become differentiated [16, 23]. We tried to identify the role of ERK1/2 in PMA-induced SRA synthesis. Treatment with U0126, an inhibitor of ERK1/2 activation, strongly inhibited SRA protein in PMA-stimulated THP-1 cells (Figure 5A). We found that U0126 completely inhibited the attachment of cells into the culture plate and thus blocked the uptake of acetyl LDL (data not shown). SRA protein synthesis in PMA-differentiated THP-1 cells was suppressed at 100 μg/ml of CWE (Figure 5B). CWE also inhibited PMA-stimulated ERK1/2 activation but in a concentration- independent manner (Figure 5D). Effect of CWE on PMA-stimulated ERK1/2 activation. A-B: THP-1 cells were incubated with or without U0126 (20 μM) or CWE in the presence of PMA for 72 h. C-D: THP-1 cells were preincubated with or without U0126 (20 μM) or CWE for 1 h and then stimulated with PMA for 30 min. SRA protein and phospho-ERK1/2 were analyzed by Western blotting. Actin or ERK1/2 was used as endogenous control. One representative Western blot of four experiments is shown. Since macrophages respond to modified LDL, fatty acids, and other lipid metabolites, persistent low grade inflammation is observed in metabolic disorders such as obesity, type II diabetes and atherosclerosis [24, 25]. LDL oxidation in the vascular wall triggers the activation of resident macrophages, recruitment and differentiation of blood monocytes, and the formation of lipid-laden foam cells . LDL could be oxidized by various stimuli but any chronic inflammatory environment further promotes LDL oxidation. Thus traditional herbal medicines that have been proved to be anti-inflammatory can be a good resource to prevent or ameliorate atherosclerosis. Since treatment of THP-1 cells with PMA induces differentiation into macrophages, this cell line is widely used for atherosclerotic research . CD11b is induced not only in PMA-stimulated THP-1 cells but also in oxidized LDL-stimulated mouse monocytes in vivo . It forms a noncovalently linked heterodimer with the common β-subunit CD18 and binds to various adhesion molecules in the endothelial cells and extracellular matrix, therefore mediating the migration and adhesion of cells during monocyte differentiation [11, 26]. Our result indicates that CWE can reduce CD11b dependent monocyte recruitment in the atherogenic lesion. Scavenger receptors consist of eight classes; among them, SRA, belonging to class A, is expressed mostly in macrophages [12, 27]. CD36, one of the class B scavenger receptors, is distributed in a variety of cells including platelets, cells with hematopoietic origin, adipocytes, and endothelial cells . The expression of SRA and CD36 can be differentially controlled. Peroxisome-proliferator-activated γ, a transcription factor that is involved in lipid metabolism and monocyte differentiation, influences the expression of CD36, but not of SRA . The different response of SRA and CD36 genes to CWE treatment indicate that CWE may separately affect PMA-activated signaling pathways that express these genes. It should be noted here that inhibition of acetyl LDL uptake in THP-1 cells by CWE was more marked than that of SRA and CD36 expression. A similar effect was observed in peritoneal macrophages of which scavenger receptors had already occupied before CWE treatment. We postulate that since CWE is likely to have high molecular weight polysaccharides, it may have some activity that competitively binds with scavenger receptors, as does fucoidan. M-CSF is produced by a variety of cells including monocytes, macrophages, and endothelial cells, and its production increases in atherosclerotic lesions [21, 22, 30, 31]. Our results showed that CWE acted on the M-CSF-induced SRA synthesis pathway, but not on its endogenous production. 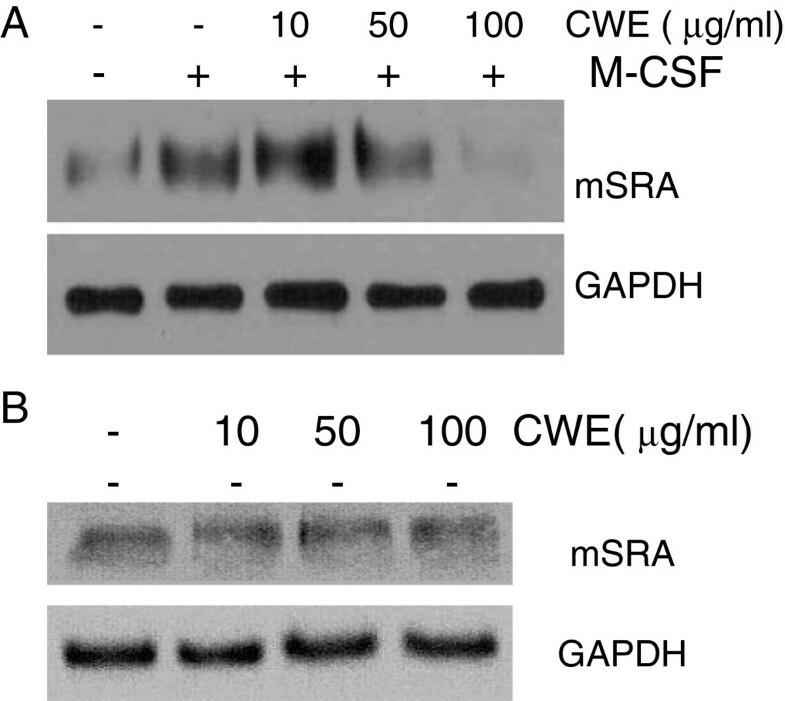 These results suggest that CWE may contribute to the prevention of foam cell development that results from the excessive uptake of lipid metabolites by SRA. PMA, an analogue of diacylglycerol, activates protein kinase C (PKC), which is a key enzyme of cell differentiation. PMA treatment causes cell cycle arrest in THP-1 cells through the upregulation of p21, a negative regulator of cyclin dependent kinases ; the increased expression of p21 is due to the generation of ROS and PKC-mediated ERK1/2 activation. ROS inhibitors are reported to inhibit the level of SRA gene expression and acetyl LDL uptake in PMA-stimulated THP-1 cells . This may explain why some antioxidants reduce atherosclerosis . Cinnamon has antioxidant hydrophilic polyphenols such as catechin, epicatechin, and tannins [6, 34]. Our previous study showed that the high molecular fraction of CWE (over 10 kDa) occupied most of its phenolics and was responsible for its inhibitory effect on LPS-induced ERK1/2 and other inflammatory signaling molecules . The same components in CWE may exert a similar effect on PMA-mediated ERK1/2 activity. However, the inhibition of SRA and other surface molecules by CWE cannot be fully accounted for by its effect on ERK1/2 because effective inhibitory concentration ranges are different. Presumably, lower concentrations of CWE have more of unidentified stimulatory ingredients that affect the pathways linking ERK1/2 to SRA synthesis. Taken together, CWE was able to interfere with monocyte differentiation and macrophage scavenger activity, indicating its potential in preventing the development of atherosclerotic lesions. Further studies are required to validate the protective effect of CWE using in vivo models. This research was supported by Basic Science Research Program through the National Research Foundation of Korea (NRF) funded by the Ministry of Science, ICT & Future Planning (NRF-2012R1A1A1014). HK designed research, performed realtime PCR and wrote the paper. JMY performed the western blot assay. YEK performed the MTT assay. SHB, TGN, and DOK performed HPLC. YJK participated in the study design. All authors read and approved the final manuscript.